Thanks for stopping by to check me out and feel free to comment, critique, tag or leave a message if you're interested in COLLABORATING!! I would like to thank you for taking the time to explore our page and you can take a look at our website which is All 4 U. We hope your stay with us is an experience in learning more about our team, services and the line of fine quality products that we offer. 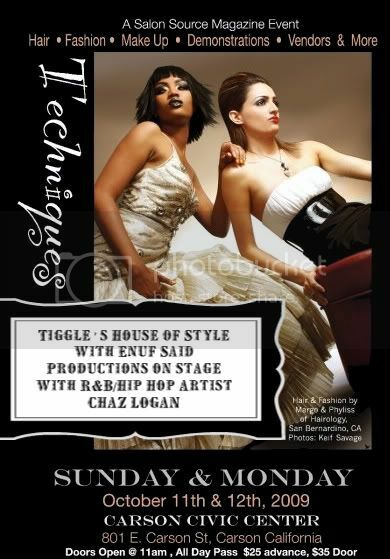 Tiggle's House of Style considers each client as an individual with his or her own needs and desires. We strive to fulfill those needs and desires with the best talent and customer service available. Experience dedicated professionalism with our talented artists. Your appearance and satisfaction is their highest priority. Schedule your next appointment with us and you will find true satisfaction with any of the variety of services we offer. We are also in Collaboration with ENUF SAID PRODUCTIONS which is one of the tops in the industry for Model Management, Major events, Promotions and so much more. Keep a look out for our Castings, Photo Shoots, Calendar shoot and Enuf Said Magazine coming your way!!! FOR SHOW CASE * OCTOBER 11 & 12, 2009 AT THE CARSON CIVIC CENTER.